All NEW construction in the valley floor just minutes from slopes, golf course, restaurants, and grocery store. With no icy hills to contend with! This house was designed from the ground up to be the ideal vacation layout and is perfect for two families to rent together. This home features TWO master suites each with king size beds and separate bathrooms (one with a double shower and Jacuzzi tub and the other with shower/bathtub). Central living area includes a great room and kitchen with views in all directions, separated by a double-sided gas fireplace to keep the entire space warm and cozy. A half bath adjoins the central living area and houses the laundry area. The home also includes a spacious loft that sleeps 4 (Two Twin Trundle Beds). Southern exposure covered front patio is large enough for the entire family to soak in the views and the afternoon warmth of the sun. Tiled radiant floor heating throughout means warm tootsies. Even the garage is heated, so bring your ski gear, mountain bikes or golf clubs inside to dry out and keep it safe! Home is cozy but feels large with its open layout and high ceilings throughout. View lot with spacious parking. Less than a mile away from the Golf Course, Tennis Courts and Children's Park. Ski parking, grocery store and restaurants only 1.5 miles. Greenbelt hiking/mountain bike trails within walking distance. Pets considered, please contact us to discuss. We fell in love with Angel Fire in 2008 while our family was relocated there for a work related project. We purchased this lot in 2011 and began building this house in the fall of 2015, and was completed in September of 2016. Our permanent home is in Albuquerque, but are hearts belong to the wonderful outdoor playground of Angel Fire! 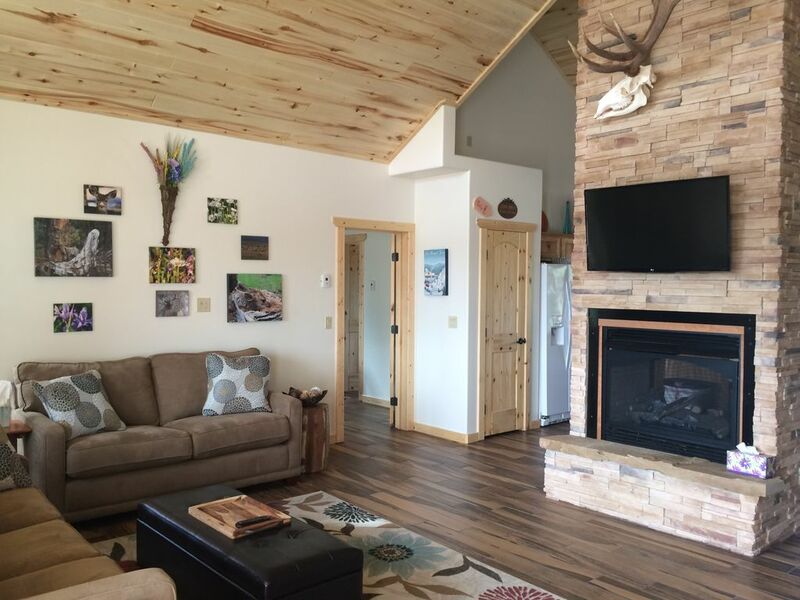 The layout and location of this house, along with its design and decor make it the best value rental in Angel Fire. Visitors will absolutely love their stay here! Home was specifically designed to be a vacation rental. The two master bedrooms (each bedroom includes a full on suite bathroom) are located at opposite sides of the home so multiple families can rent the home together and enjoy comfort and privacy. The bedrooms adjoin a lovely great room comprised of the living room, kitchen and dining area, separated by a cozy double-sided gas fireplace. The home features an oversized heated garage so you can keep your vehicle and gear warm, safe and dry. Every room of the home has great views and the home sits off a low-traffic road with no adjacent houses, making it peaceful and quiet. All these features within minutes of every amenity that beautiful Village of Angel Fire has to offer! The Village of Angel Fire is a beautiful mountain town with several restaurants, bars, sporting goods stores (mainly ski & mountain bike), two gas stations and a well stocked grocery store. Radiant Floor heating throughout house and garage. Oversized garage can easily accommodate one car plus bicycles, skis, golf clubs and other toys. Area to hang ski clothing to dry. Utility sink. High speed fiber internet with Wi-Fi. Both master bedrooms have USB charging stations located on bed side tables. Contact Owner - we have some equipment that could be borrowed (tennis rackets, snowshoes, bicycle pump/tools). Great place to relax, includes queen size memory foam fold-out sofa. Ottoman stores board games and cards. Fully stocked with quality appliances (blender, pancake griddle, mixer, popcorn popper), non-stick cookware, dishes and utensils. Quartz countertops, large island and plenty of room for cooking. Counter height, four chair dining room table plus two chairs at kitchen island. Two additional dining chairs in garage can be squeezed around dining table. Flat screen in Great room. Flat screens in both bedrooms. Variety of DVDs - but why are you watching TV - get outside and enjoy Angel Fire! Monte Verde Lake offers peddle boat, canoe and paddleboard activities plus fishing less than two miles away. Large covered patio in front of house with warm southern exposure. Small uncovered patio in back of house off of kitchen/dining. Angel Fire Country Club has 4 outdoor tennis courts less than a mile away. Angel Fire resort also features summer activities such as an incredible zipline course, chair lift rides, and both cross country and a downhill mountain biking - the largest mountain bike park in the Rockies! The house was clean and equipped with everything we needed for a few days in Angel Fire. Nice area, close to the lifts, grocery store, etc. Only suggestion for improvement I would make is adding a TV to loft area upstairs. Highly recommend this property and would most definitely stay here again! Great communication with owner. Home is well stocked. Everything is very clean. Will stay there again. The property was gorgeous, nestled in the trees high above the town. Right from the start the whole process was streamlined and efficient! Acceptance to checkout was the easiest we have ever encountered. The home was well appointed and maintained. Awesome experience, thank you Laurie!!! The owners were professional, helpful, and welcoming. You need to stay in this wonderful home! Leaving AF now after a 4 day stay at this house. It is perfect. We had 4 adults and 3 kids and it was just what we needed. Location is great, about a 5 min drive to the mountain or in to town. Beds were comfy, kitchen was fully stocked. The owner, Laurie, was very helpful and always quick to respond. Would definitely come back and stay here!! Great trip! I will stay here again! We LOVED our stay. We had a great view, a family of deer walked right up to our door! Great location, great amenities. We shared with another family and the two master bedrooms is perfect! Everything was clean, kitchen is very well stocked,beds were comfortable. I would love to come back in spring or summer and golf/hike/explore the area more! Tan Stucco house with Blue/Teal roof on Traveler Map location aerial photo is our home. Telephone navigation will get you onto Torrey Pines, but typically directs you to an empty lot a little to the east.